Having had a browse online for the various Membrillo recipes I figured the principle was simple: rinse and chop the quinces (skins, stones and all as this is where the pectin is) and put in a pan and just cover with water. 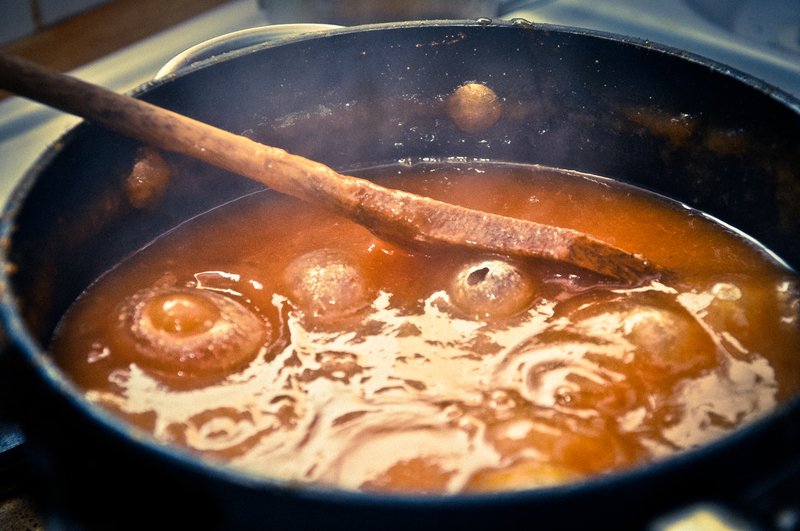 I then added a cinnamon stick and wanting to add a vanilla pod, but finding that way too extravagant for this experiment (and my pocket), I added a cap of really good vanilla extract then brought the concoction to the boil and simmered for about 40mins until everything was mushy. I tasted a spoonful of the water whilst this was going on- it was amazing so I had a hot cup of that whilst waiting. The smell of this quince mixture simmering away made the house smell far more Christmassy than I was prepared for and immediately prompted a quick Sherry. Once I was happy with the mushiness I got out my trusty stick blender and blended it to within an inch of its sticky life, pushed it through a sieve to get rid of the stones then popped it back in the pan with about a kilo of sugar (I tried weighing the mix as you should add roughly the same amount of sugar but my scales are rubbish,I never use them, so just guessed). This then bubbled away for about 45mins and reduced until it was quite dense. I also managed to sustain a couple of vicious molten lava spits of sugary quince goo during this so just be aware of this and turn the heat down a bit rather than drinking too much Sherry and coating your hob, walls and self with orange burning splodge. It was right about this point that I decided I would form a splinter pot of Rose and Cardamom Membrillo as it just seemed to make sense, so put a few ladles of the orange goop into a smaller saucepan, added a capful of rosewater, crushed a few cardamom pods and added the crushed black seeds to the mix. It instantly smelt amazing! I had a Sherry to celebrate my ingenuity. This Sherry further inspired a third splinter goop pot. Ages ago I had tried a baked fig ball and decided that this seemed like a great cheese accompaniment so raided the pantry and found figs, pistachios, some flaked almonds, walnuts and a few hazelnuts too. 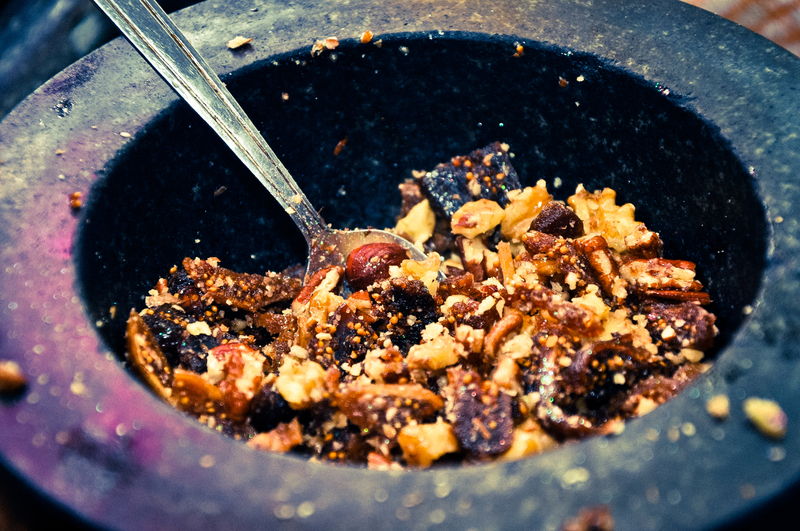 I chopped up the figs then this all went into the mortar and was pestled until just broken up. Then I found a bottle of Ameretto and a glug of that went in, just because. So Quince Goop 1 was reducing and bubbling away nicely, spitting fiery venom around the kitchen, so I took a ladle full of this and mixed it in with the figgy mix and then squashed the mixture into a silicone mould that I had oiled. 1 down. 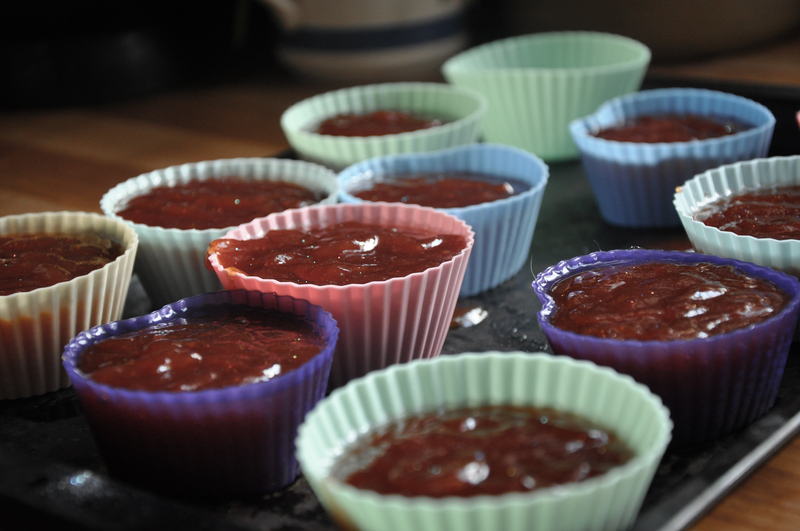 The Rose and Cardamom mix was getting really sticky so poured that into little silicone moulds too. 2 down. Had a Sherry to congratulate self. I left the original mix to bubble away a little more. 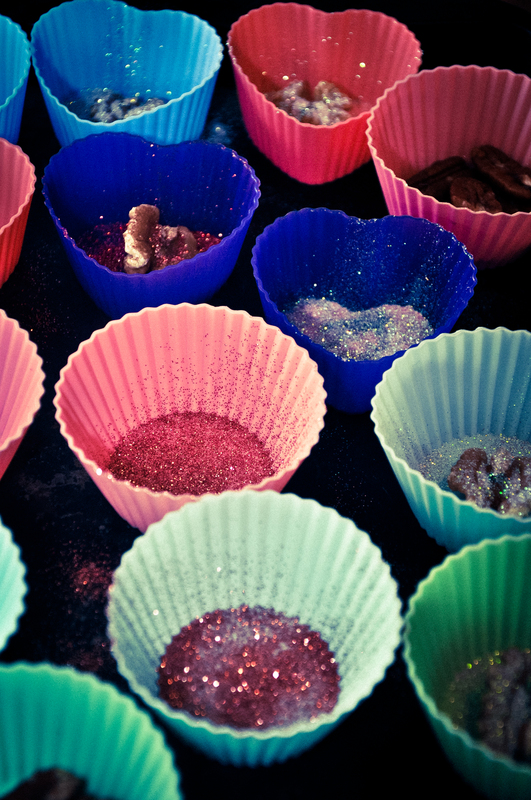 I was on a creative roll now and decided to sprinkle some edible glitter and a few walnut halves in the bottom of a few of the remaining silicone cups as I was feeling oh so Fabulous after all. 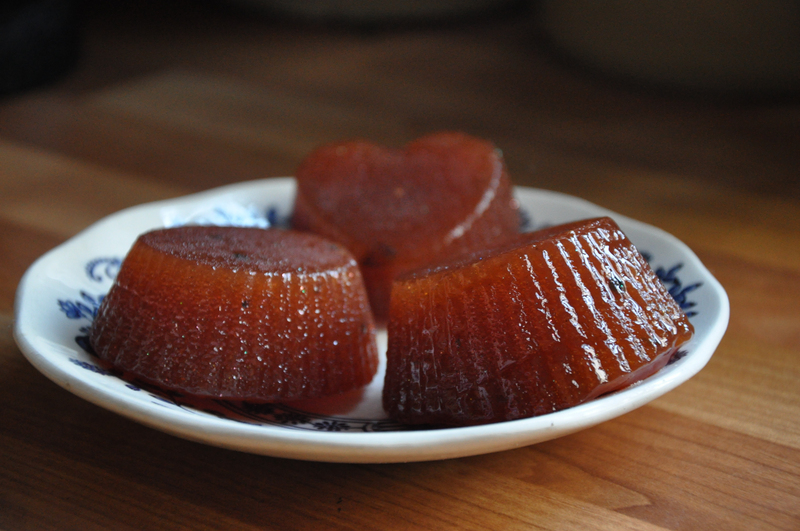 Once I thought things seemed OK-ish in went the bubbling quince paste and I left them to set overnight. I would love to say the following morning that they were all beautifully set but my slapdash sugar antics meant that they were still a bit soft so I decided to just pop them out of their moulds back into the pan, add another half bag of sugar and bubble them away. This is what I love about stuff like this, if you get it wrong it really doesn’t matter, just fix it. 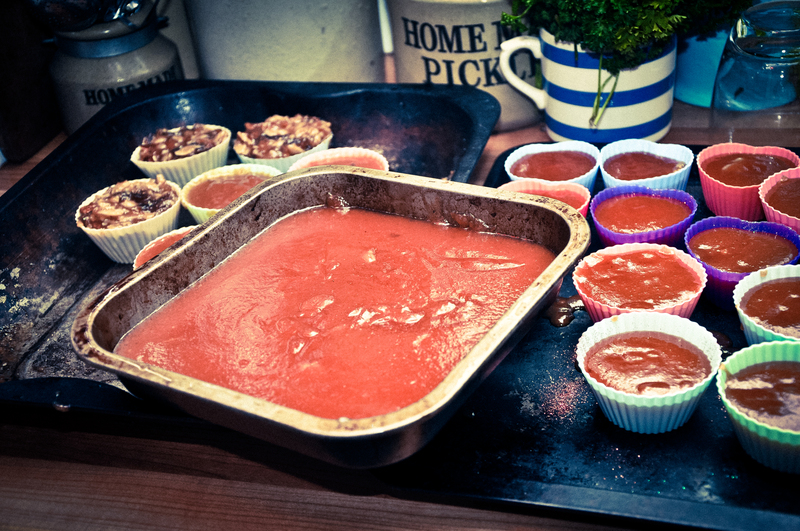 It did mean however, that the edible glitter was now scattered throughout the quince paste which I actually kind of liked.This then carried on gently bubbling for 30minutes then I poured the mix back into the cleaned and oiled moulds and this time they set perfectly. Phew. Sherry? 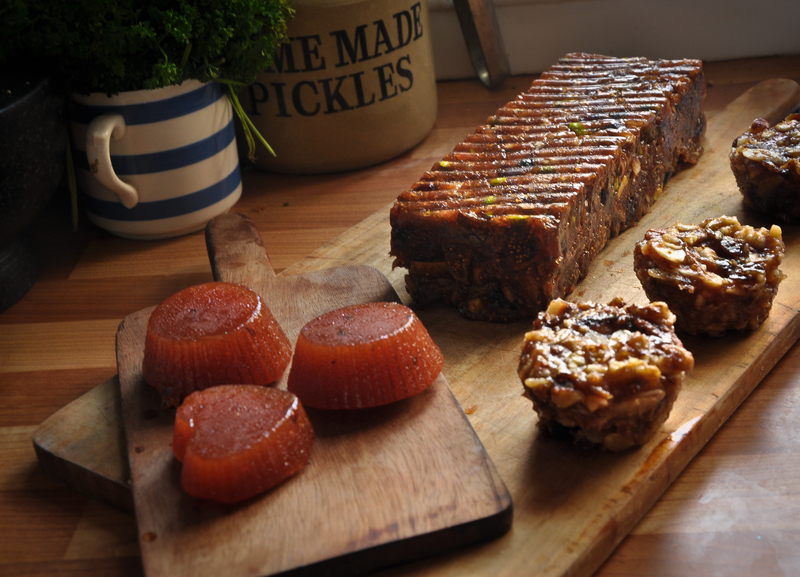 So, I am left with 3 wonderful batches of quince goodies, The Figgy Quince Amaretto Nut Loaf which is not just great on a cheeseboard but I’m pretty sure you could probably survive on it if ever stuck on a mountain somewhere and its a lot nicer than Kendal Mint Cake. 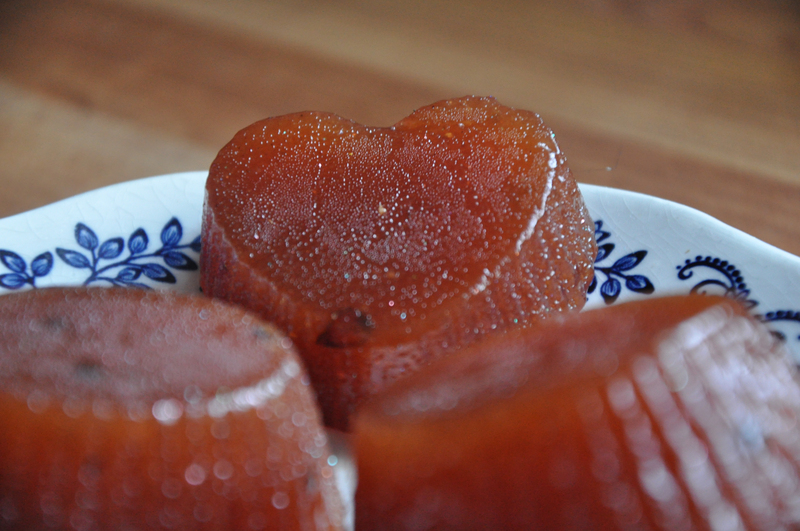 And the plain Membrillo ones are staying in their moulds until tomorrow when I wrap them and give them to my neighbours for Christmas. I’m nice like that. You’ve done fabulous justice to our quince! The little moulded cheeses look wonderful, so pretty. Thanks for sharing. 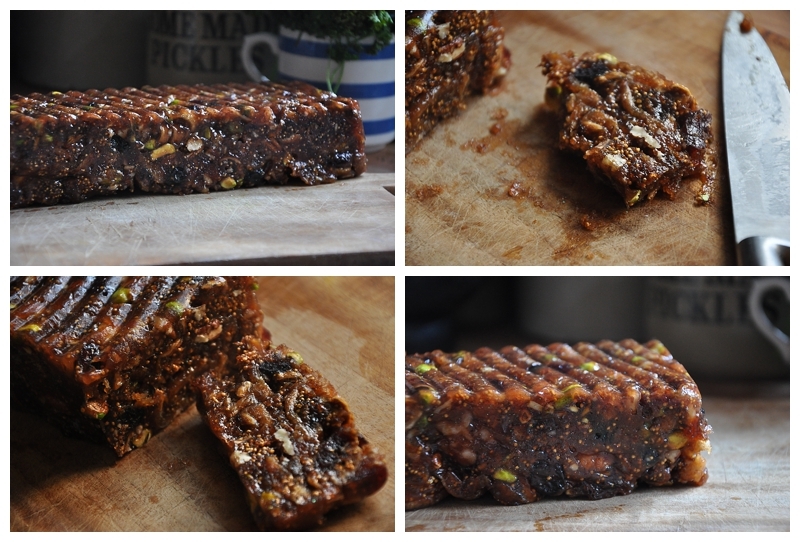 Great post, looks divine and lovely photos!